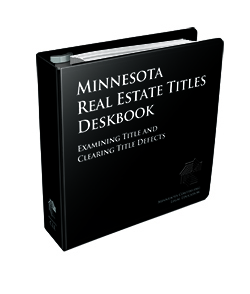 The Minnesota Real Estate Titles Deskbook is written and edited by experienced real estate practitioners, and provides an in-depth analysis of all aspects of examining title and clearing title defects. The title exam portion of the Deskbook dives into topics like marketable title, legal description, conveyances, and encumbrances. The resolution of title problems section dives into the different ways to resolve those problems, including voluntary resolution, cancellation, property registration, and actions involving the courts. Written with the practicing attorney in mind, the Deskbook includes valuable insights and practice tips collected from the editors’ and authors’ many years of experience and practical know how. Order yours today! To get this deal, call us and request FREE SHIPPING. Phone orders only. Free shipping goes through Tuesday, March 26, 2019. Admitted in the past three years? 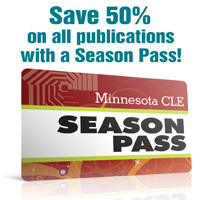 Purchase publications for half price! View all publications and start taking advantage of your new-lawyer discount. Ensure deliverability: Add MinnesotaCLE@minncle.org to your address book to ensure receipt of future emails.